10 Steps To Freaky Arms! Here are 10 concrete steps you can take to get the most out of your arm training. Learn more about these critical steps to bodybuilding success. Ever found yourself standing in front of the mirror, flexing your mighty guns... and nothing really happens? You go to the gym, hit the weights hard, but the measuring tape and the mirror tells the same old story despite your efforts. Don't be discouraged - some people aren't genetically blessed with freaky-thick arms, but there are plenty of things you can do to make the most of the cards you were dealt. Here are 10 concrete steps you can take to get the most out of your arm training. The first five deals with training, while the last five addresses secondary issues that remain critical to your bodybuilding success. However, were you to get a cross-section view on your upper-arm, you'd quickly realize that the real player is triceps. 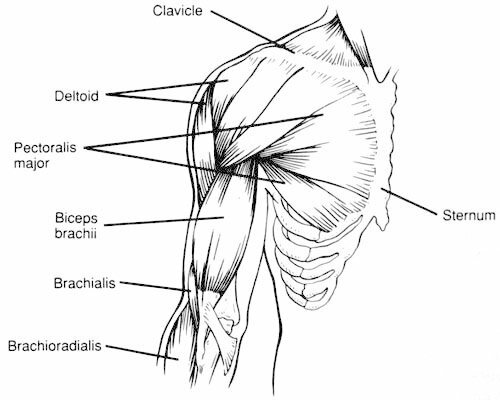 In simplified terms, your triceps makes up about 2/3 of the muscle mass while biceps and brachialis, biceps' little helper, make up the remaining 1/3. Right there we see why it is folly to put all your effort into hammering biceps while doing a few sloppy tricep pushdowns as an afterthought before hitting the showers. If you want to beef up your arms, make triceps at least as much of a priority as biceps. The whole point of lifting weights is to trigger a growth response. Anything else is maintenance at best and a waste of time at worst. In order to hit the sweet spot, you must first push yourself beyond your comfort zone. To achieve this, you must lift heavier and/or do more reps than you're used to. The former is primarily what stimulates fast-twitch muscle fibers, while the latter targets slow-twitch fibers. Some muscles have a high ratio of slow-twitch muscle fibers and may benefit from more reps with lower weight. Biceps and triceps aren't among them. For best results, focus primarily on fairly heavy training in the 6-8 rep range (using strict form) with just the occasional couple weeks of lighter training thrown in to keep the muscles guessing. Explosive as biceps and triceps may be, they also tire quickly. Doing set after set of bicep curls for hours may be downright counterproductive, while just a few, high-intensity sets where you really wring every ounce of juice out of the muscles, is enough to trigger the growth response mentioned earlier. And once you've done that, what's the point of continuing? You've won the game - time to collect the trophy and go home. Always doing the same exercises with the same weights won't push your muscles out of the comfort zone once the novelty has worn off. Keep'em guessing - make changes every couple workouts! These don't have to be earth-shattering changes. Sometimes just moving the order of exercises around, replacing a cable-movement with free weights, or why not do a crazy set with half the weight you normally use - only this time to do 50 reps? True, there are only so many variations on bicep curls you can do. That's why there is a bunch of bars to try, from your standard EZ-bar to hammer curl bars with half a dozen widths and angles. Likewise, cable-based and plate-loaded leverage machines provide a wide variety of angles and resistance grooves. With some imagination, even sparsely equipped gyms can provide plenty of variation. As the name implies, biceps and triceps consist of two and three distinctly different sections, respectively. In order to maximize development, you should make an active effort to target each part in every workout. So how do you accomplish this? If you're serious about your training, this is where you go back to the anatomy chart and use deductive reasoning based on biomechanics, coupled with practical experimentation to learn the right "feel" of stimulating specific parts. As mentioned in step two, intensity is the magic key to growth. One way to up the ante and potentially speed up your progress is to throw in the occasional intensity booster. These include forced reps, partial reps, negative training and drop sets. But here's the thing: all of the above taxes your muscles and your nervous system by essentially circumventing the body's natural limitations. Sure enough, that will send it into overdrive in beefing up the muscle fibers, but you also dance closer to the edge of injury. The biggest risk, however, isn't necessarily that of a snapped tendon or ligament. If you make it a habit to consistently boost intensity using the techniques mentioned above, you are all but guaranteed to slide into overtraining. In a nutshell, this is the state where you cause more damage than your body is able to repair between workouts - taking one step forward, two steps back with every workout. Limit yourself to one or two exercises every other week, at most. This ties in with the overtraining aspect - the body must be allowed sufficient time to fully rebuild itself and then some in order to grow. The easiest way to address this issue is simple: get a good night's sleep! While we're all a little different in our need for sleep, the good old eight hours a night is a good starting point, while many benefit from nine or even more. Mid-day napping can be a great way to recharge the batteries. Some metropolitan areas have places offering "powernaps" in special sleeping pods, but most of us get by just fine lying down on the couch or flipping the car seat back with a cap over our eyes for half an hour. In Australia, the Transport Accident Commission has invested in advertising campaigns, advising drivers to take a "15 minute powernap" to help reduce the risk of fatigue when operating a motor vehicle. In New York, a company called Metronaps has opened a branch in the Empire State Building, charging patrons $14 for the use of facilities (semi-enclosed 'capsule' lounge chairs) for a brief power nap. Patrons can also purchase membership for $65 per month. Why is sleeping so beneficial? Not only does it make you mentally refreshed, you also have a bunch of naturally occurring growth hormones being released as you sleep. All things considered, it just makes sense to let the body get the downtime it needs to recover and overcompensate, aka. building new muscle mass. The foundation of growth is simple: consume more calories than you burn. If you barely eat enough to break even, where is the extra bodyweight going to come from? Think of it as a leaking bucket of water, where the leak is how much you burn each day by sleeping, walking, training and whatnot. If the water level in the bucket is to rise, you must pour in more than leaks out. It's that simple. However, this is not a perfect analogy in that massive overeating won't make you grow faster. In fact, once you've hit break-even and some 500 calories or so beyond that, you run the risk of gaining body fat. This varies by size, age, diet and a bunch of other factors, but the bottom line is that it's a game of consistently eating a little more than you burn every day. Talk to a local nutritionist or certified personal trainer if you need help customizing a meal plan suitable for you. Taking in enough calories is important, but most of us can benefit from a little extra help. Your basic protein powder is a given staple, as is the daily multi-vitamin. For extra power, consider doing a few cycles of creatine monohydrate. This will help you lift heavier weights for more reps while having been proven to be perfectly safe, so there's no reason not to give it a try. The price has come down considerably in recent years; the shopping page of this site has some great deals. Another supplement to consider is nitric oxide. This relatively new supplement increases the blood flow and creates that "pump" that lets you really feel the muscle work. It's pretty motivating and helps bring out that extra effort. Then there's nice-to-have stuff like HMB, BCAA and a bunch of other stuff that you can try if you've got spare cash, but the protein, multi-vitamin and creatine are the only real must-haves. Stretching decreases soreness and may help prevent injury. By flushing out the byproducts of hard training and getting fresh blood and nutrients into the muscle, you'll recover faster. Stretching also prevents shortening of the muscles, which can make you more prone to injury down the road. Another reported benefit of stretching is that it may help expand the fascia that the muscle fibers are encapsulated in. If you're wearing a shirt that is one size too small, your range of motion is compromised. The muscle fibers work the same way -- if there's not room to grow, they're less inclined to do so. Finally, one reason your arms may not look very freaky is that you have a thin layer of fat obscuring the lines. Make no mistake; this seemingly small detail can make all the difference in the world. Ever notice how some pro bodybuilders can look fantastic one show, and then be just blah a week later? That often has to do with water retention mishaps, meaning there's a thin film of water buildup under the skin which makes them look all flat and sorry despite being in just as good shape as they were a week before. A thin layer of body fat has the exact same effect -- except it's not just a temporary mishap. So if your measuring tape shows you've made some arm progress but the mirror doesn't show it, losing a few pounds may help. There's no need to go nuts aiming for the low single-digit body fat percentage that the pros do; just get rid of the love handles and you should notice considerable improvement.